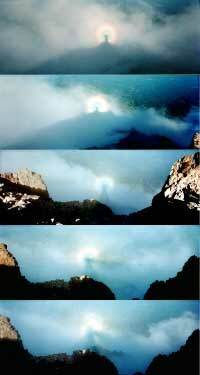 These Glory Photo's were taken by Larry Auxter on the evening of September 5th.. 1993 on the summit of Mt. Shasta (14,162 ft.). These five glory photos capture the Summit of Mt. Shasta in soul lifting beauty. These breathtaking and spiritual photos reveal a silhouette cast on the clouds below, surrounded by a colorful 360 degree rainbow. These glory photos are extremely rare, so take this opportunity and purchase the recordation of this event.